DIED AT WHEATLAND. JUNE 1, 1868. James Buchanan served as president from 1857 to the eve of the Civil War in 1861. The presidency was the apex of his long political career—US Congressman from Pennsylvania (1823-1831), Minister to Russia (1832-1833), US Senator from Pennsylvania (1834-1845), Secretary of State (1845-1849), Minister to the United Kingdom (1853-1856). Buchanan came to the office during a time of tumult and sectional unrest and seemed unable to lead the country out of the morass. His efforts to appease Northerners and Southerners pleased no one. Sentiment turned against Buchanan. Less than two months after he left the office Fort Sumter was fired upon beginning the war. In the many polls that are taken of the general public and historians, President Buchanan nearly always ranks at the bottom, scolded by the critics and obscured by his towering successor, President Abraham Lincoln. Buchanan, at 78, already suffering from the effects of old age caught cold and grew weak. He knew his time was drawing to a close and told his executor, “I have always felt and still feel that I discharged every public duty imposed on me conscientiously. I have no regret for any public act of my life, and history will vindicate my memory.”—a defense of his administration and presidency. 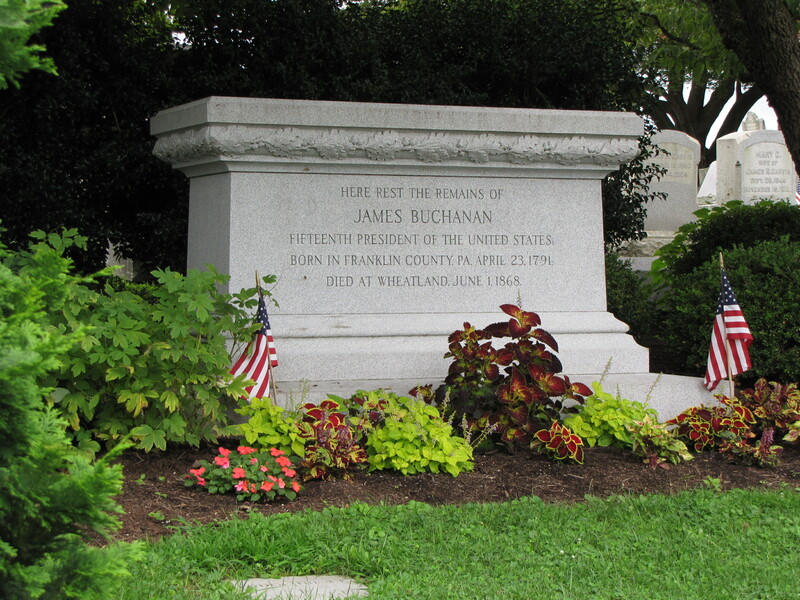 President Buchanan made clear that he wanted a simple funeral devoid of pomp or circumstance. However, that was not to be. Nearly 20,000 filed by his casket before his burial in the Woodward Hill Cemetery at Lancaster, Pennsylvania. He was remembered in the speeches delivered on the day of his funeral as a log cabin American; he was even compared to Lincoln—one who began in meager beginnings but rose to the highest office in the land. His marker is tucked under several shade trees where he is laid to rest under a simple gray granite monument ornamented only with a simple band of oak leaves and acorns symbolizing strength.